Last month we headed up to Sleeping Bear Dunes National Lakeshore in northern Michigan for the first time and spent a great week exploring the area! 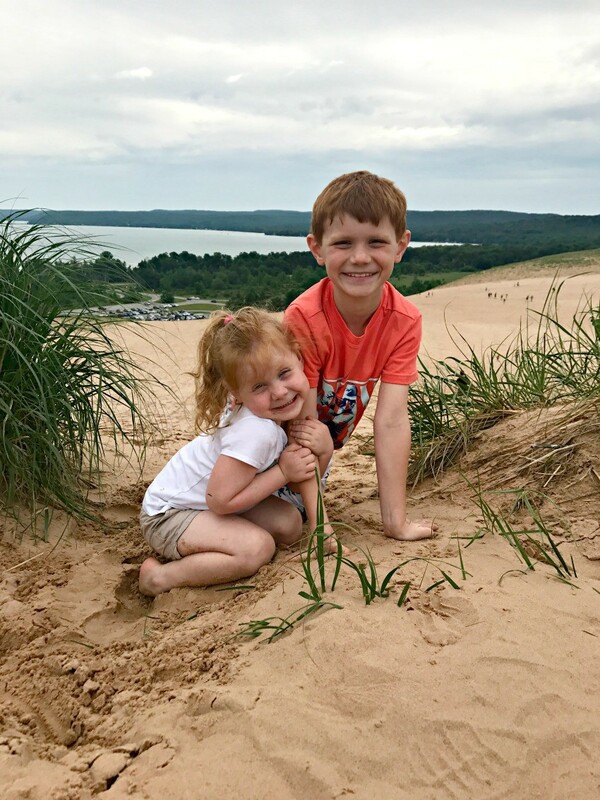 I thought I’d share my own Sleeping Bear Dunes Travel Guide for Families like mine who are heading up there for the first time! 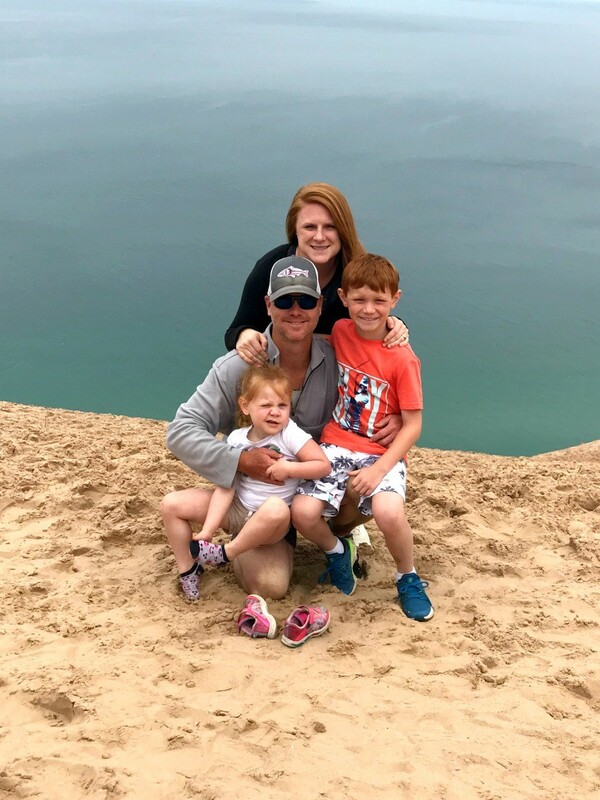 I’ll give you the inside scoop on things to do at Sleeping Bear Dunes, where to stay at Sleeping Bear Dunes, and our favorite parts of the Northern Michigan and Traverse City areas!! 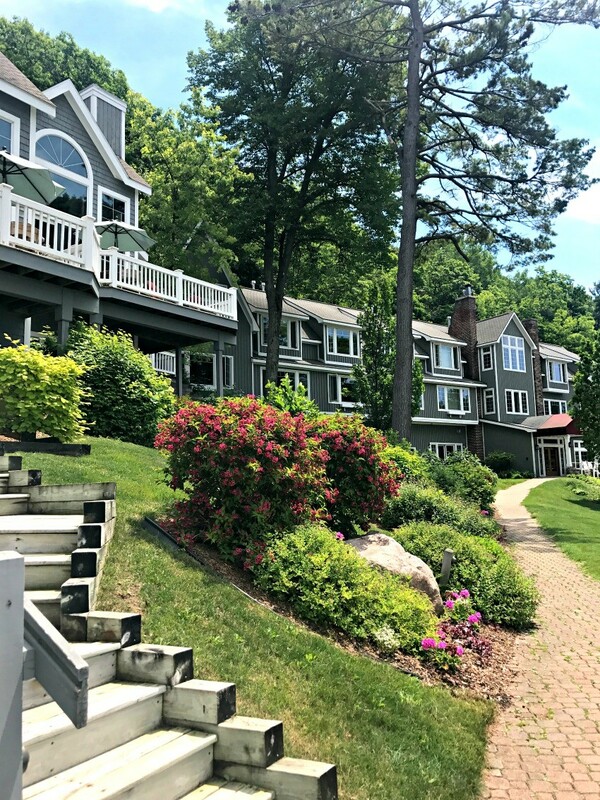 If you’re trying to navigate the hundreds or thousands of options on where to stay in Sleeping Bear Dunes, try not to be overwhelmed. 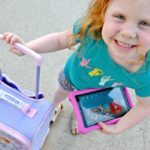 There are tons of loading options depending on what your family wants to do. For example, for us, we looked for Sleeping Bear Dunes cabins for my family and my parents to stay at for most of the week, but my husband and I were coincidentally celebrating our 10 year wedding anniversary that week too, so we looked for some Sleeping Bear Dunes hotels to stay at and ended up booking a room for one night at The Homestead. It was nice because there was SUCH a difference in our lodgings. The cabins were rustic, basic, but really helped us disconnect and get out and enjoy nature. 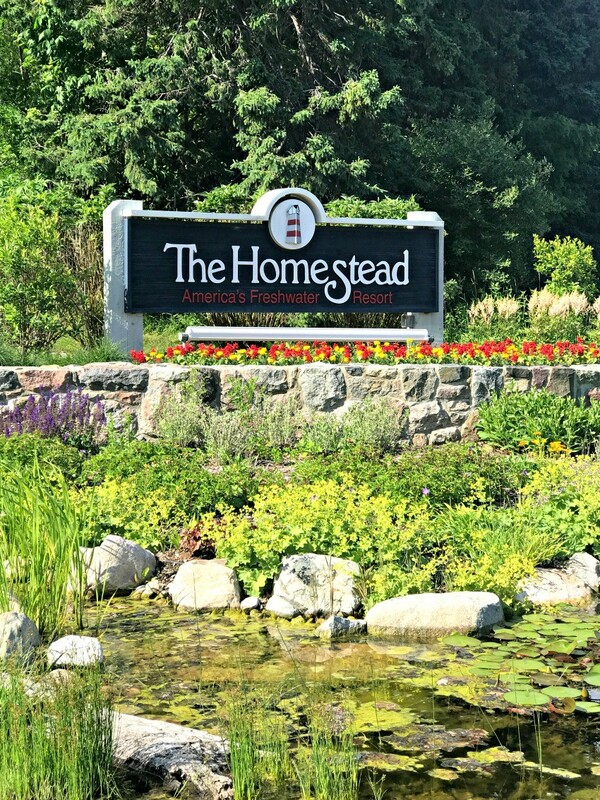 The Homestead was more of a resort like experience with fine dining, a beautiful pool, and gorgeous Lake Michigan views!! So it really depends on your budget and what you’re looking for, but if you’re looking for a high end place to stay, I’d recommend The Homestead. The Homestead has both hotel like rooms, as well as condos for rent too. 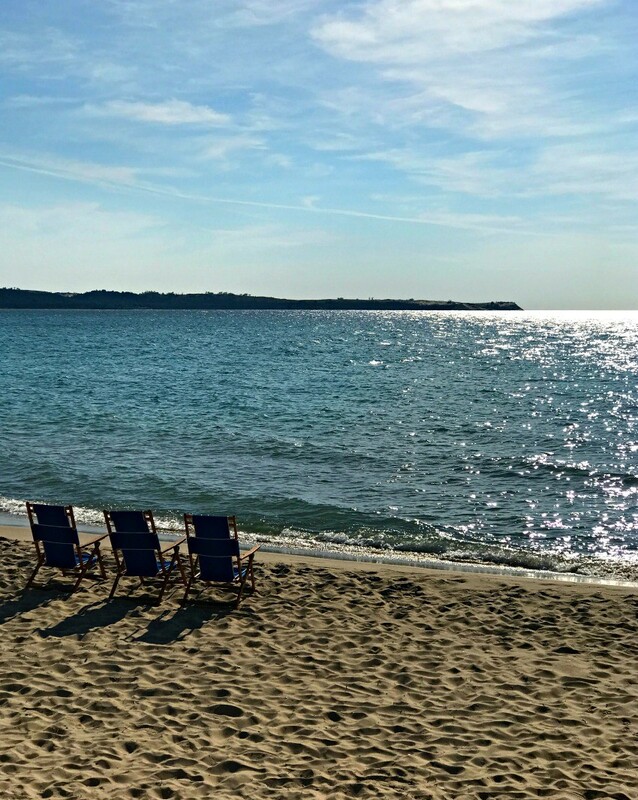 They offer two swimming pools, fine dining at Cafe Manitou, and a gorgeous beach right on Lake Michigan’s bright blue waters. 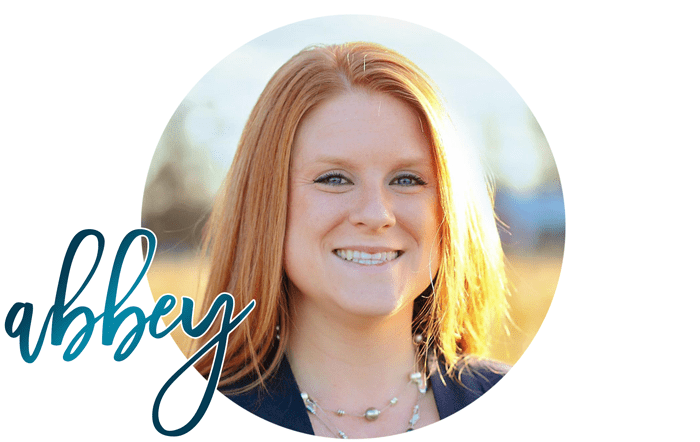 Their grounds are amazing and if you or your spouse enjoys golfing or want a relaxing day at the spa, they have that too!! It truly is a high end experience! I will add that the Homestead is nice because it’s in the heart of all things Sleeping Bear Dunes. 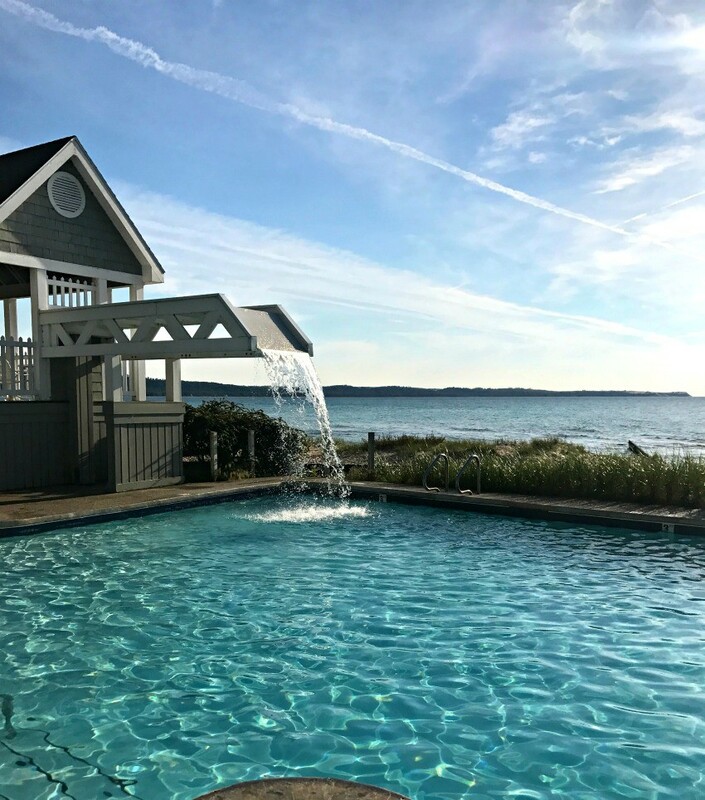 You’re close to all the cute towns, like Leland and Glen Arbor, you’re right on the lake, you’re not far from the dune climb, and you get the best of both worlds with the lake and the pools right there. It’s the perfect location if you want to be in the heart of it all. 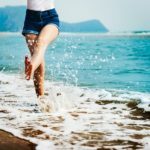 We had such a great stay at Sleeping Bear Dunes and as a person who likes to see and do all the things on a vacation, I had a carefully laid out travel itinerary. 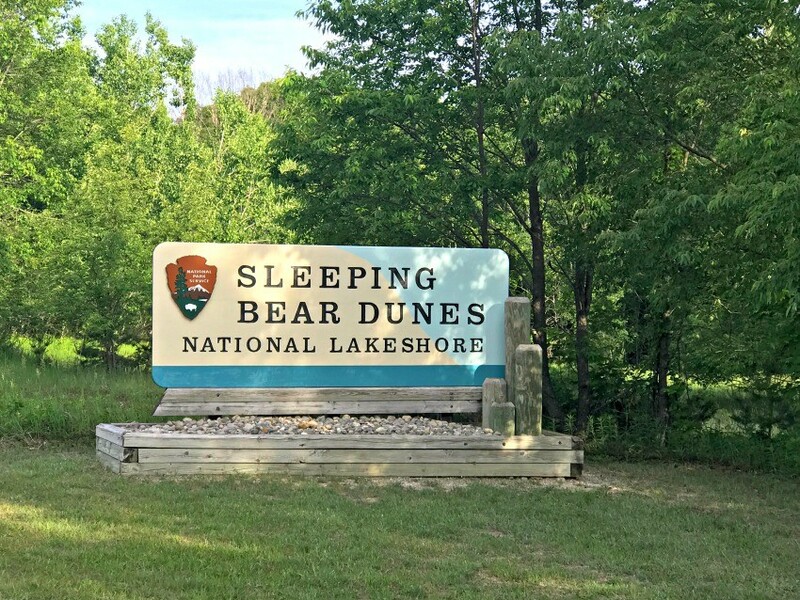 Here’s what our week at Sleeping Bear Dunes looked like…your own Sleeping Bear Dunes Travel Guide. Day One (Sunday): check into our cabin and relax (fish, swim, grill out). When we stayed at our cabins, we stayed about 20 minutes south of lake. I’d choose somewhere closer or just stay at the Homestead in the future for the whole week. Day Two (Monday): *it rained* so we took the day to visit Traverse City, Michigan. They have cute shops and eateries there that we took advantage of. Be sure to grab a slice of pie at Grand Traverse Pie Company! 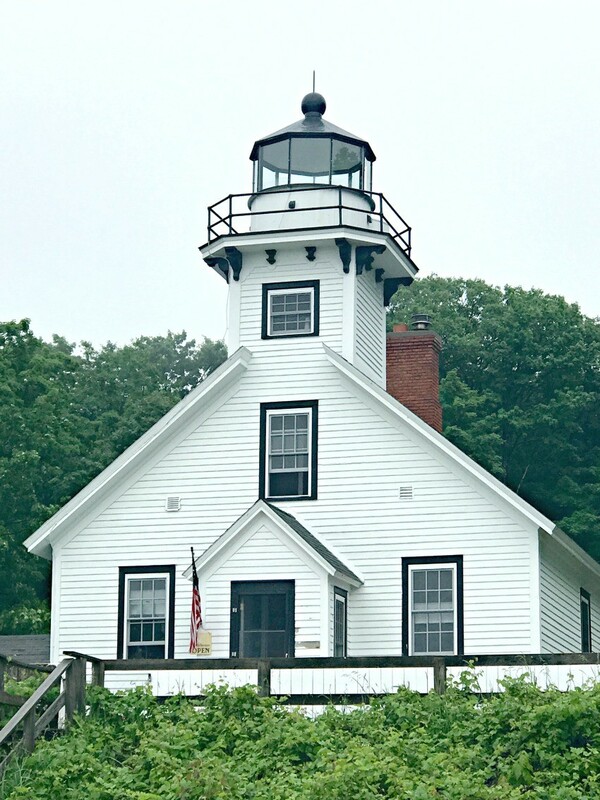 We drove up the peninsula in Traverse City to see all the gorgeous houses in the area, to check out the wineries, as well as take a look at the lighthouses! Day Three (Monday): We headed into Sleeping Bear Dunes National Park to do the Pierce Scenic Stocking Drive. Heads up, it does cost $20 to do the drive, but the pass is good for the week so you can come back if you wish to. 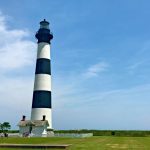 The views from the different stops along the drive are stunning, so don’t miss this part of the trip! 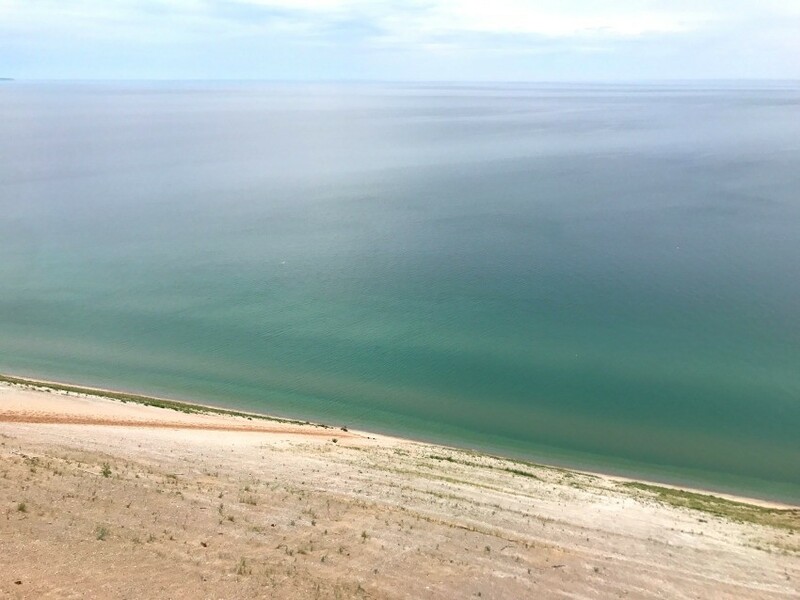 This is the best spot at Sleeping Bear Dunes to get amazing views of the gorgeous blue Lake Michigan! My favorite tops along the Scenic Drive were the Dune Overlook and Lake Michigan Overlook! Do it on a nice, sunny day so you can get those amazing photos. Cloudy or overcast days won’t show as much! 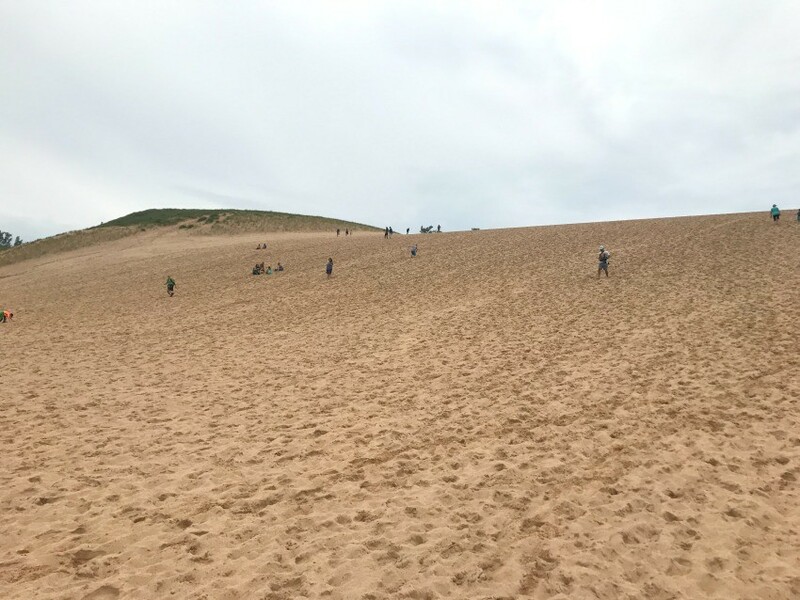 This same day we also traversed some of the Sleeping Bear Dunes trails including the infamous Sleeping Bear Dune climb, which the kids really enjoyed! This isn’t for the faint of heart though, so take your time! After we had lunch, we decided to go and explore some of the cute towns in the area. I definitely recommend visiting Glen Arbor and Leland!! 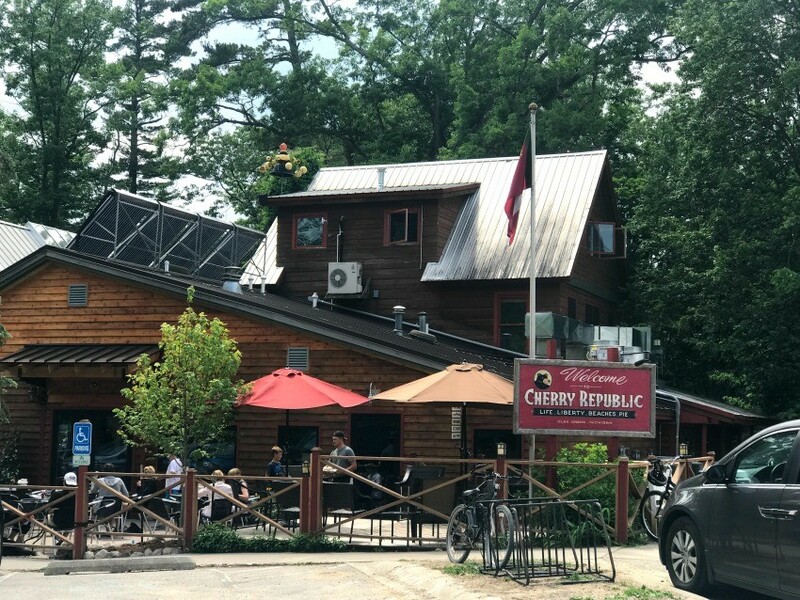 Stop by Cherry Republic in Glen Arbor, it’s super cute and has a great little winery to taste their unique wines! 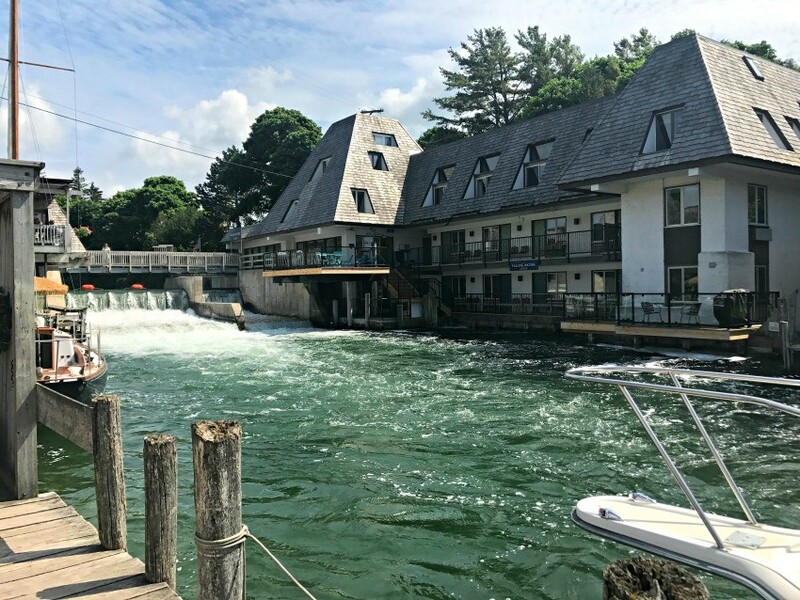 Walk down the road in Glen Arbor to dip your feet in the crystal clear waters of Lake Michigan and then head into the town of Leland to do some shopping in “Fishtown” and eat dinner! *the above photo has not been edited nor have any filters been applied…the water is LITERALLY that blue and clear! We ended the evening after dinner letting the kids play at a cute playground right on Lake Michigan in the city of Empire. Lake Michigan Beach Park playground in Empire is located 3 blocks west of M-22 and is such a great playground and definitely another Sleeping Bear Dunes secret! The beach is right there too so once your kids get worn out on the playground you can search the beach for treasures and enjoy the views of Lake Michigan and the Dunes! So as you can see, we had a very busy Day Three visiting Sleeping Bear Dunes! Day Four (Tuesday): today we relaxed at the cabins and went out on the kayaks, swam in the lake, and enjoyed some local food and ice cream. This was our laid back day after the craziness of Day Three! Day Five (Wednesday): Today we headed 3 hours north to Mackinac Island! I wrote a whole separate blog post on that trip, but suffice it to say, it’s totally worth it!! 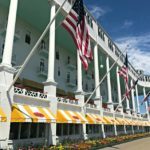 Don’t miss out on the opportunity to visit Mackinac Island if you can! Day Six (Thursday): This was the day that we spent at The Homestead (photos above). 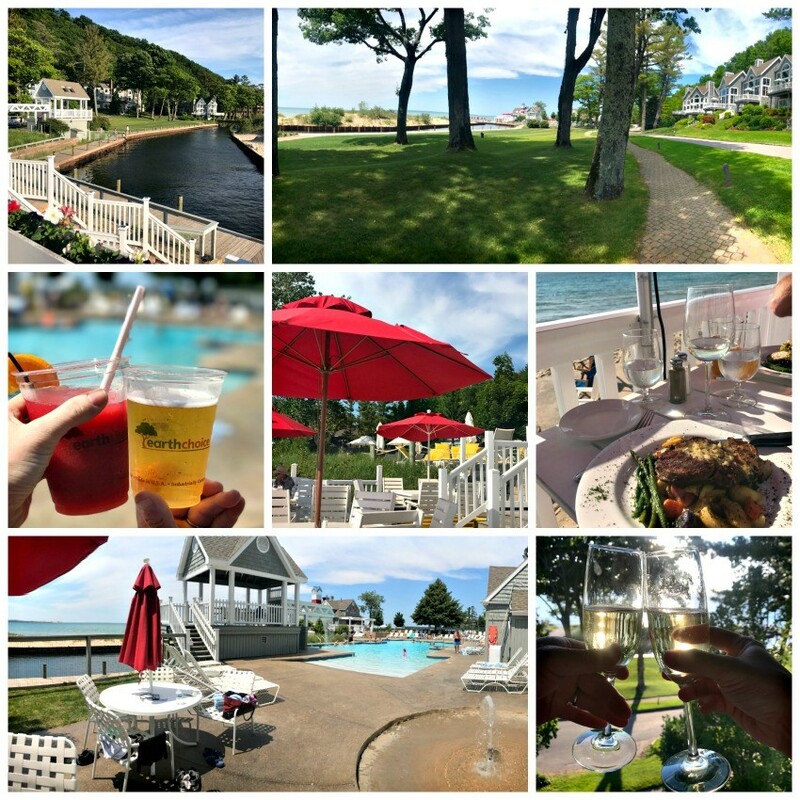 We spent the day swimming at their gorgeous pool, then we dropped the kids off in Glen Arbor with my parents and we spent the event dining at Cafe Manitou and enjoying the resort and hotel! Day Seven (Friday): Spend the day kayaking the Platte River with Riverside Canoe Trips! Kayaking was so fun in Michigan that my husband came home and purchased a kayak for his own personal use! Don’t be intimidated by kayaking, even I did it for the first time and SO enjoyed it, take the opportunity to enjoy kayaking a beautiful area on this trip! 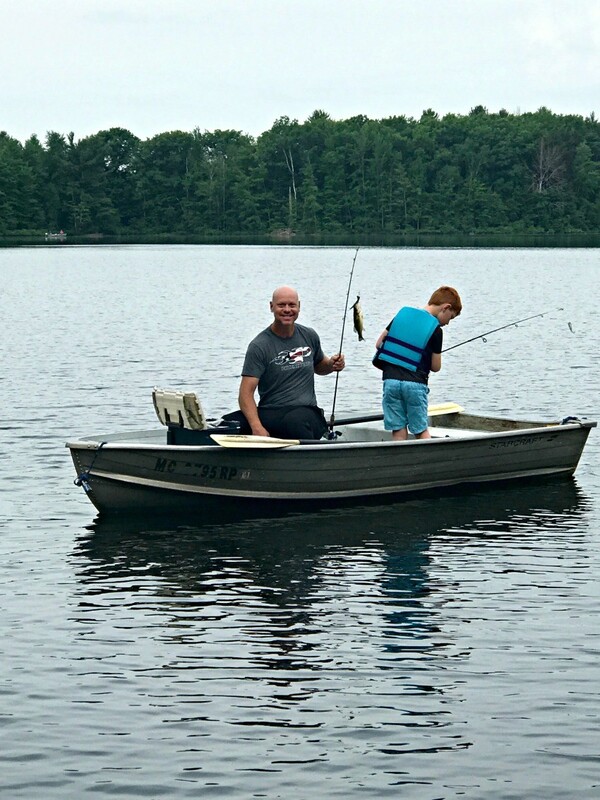 We SO enjoyed our vacation in northern Michigan and we cannot wait to visit again. 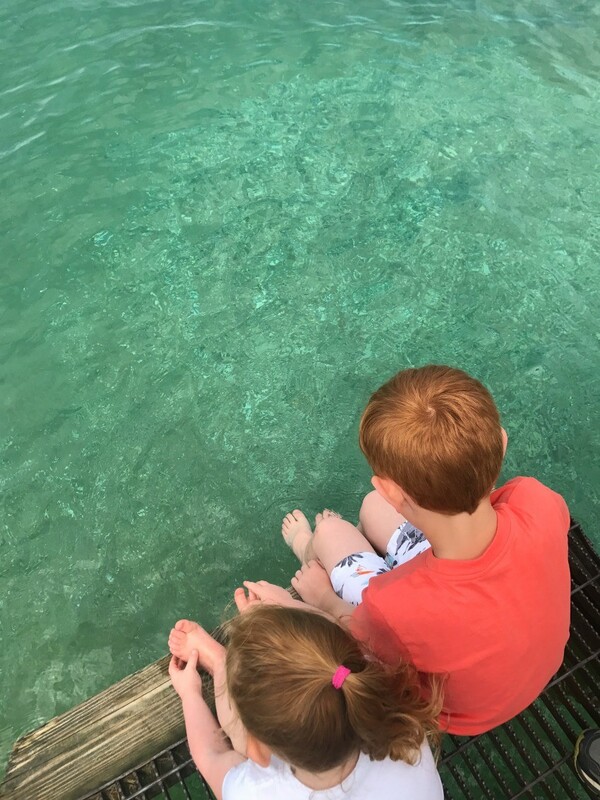 The great thing about Lake Michigan is that it’s not too far from Central Ohio and you can enjoy beautiful ocean-like fresh water and stunning views! Don’t miss out visiting Sleeping Bear Dunes with your family at some point in time…it’s a great family vacation idea!! 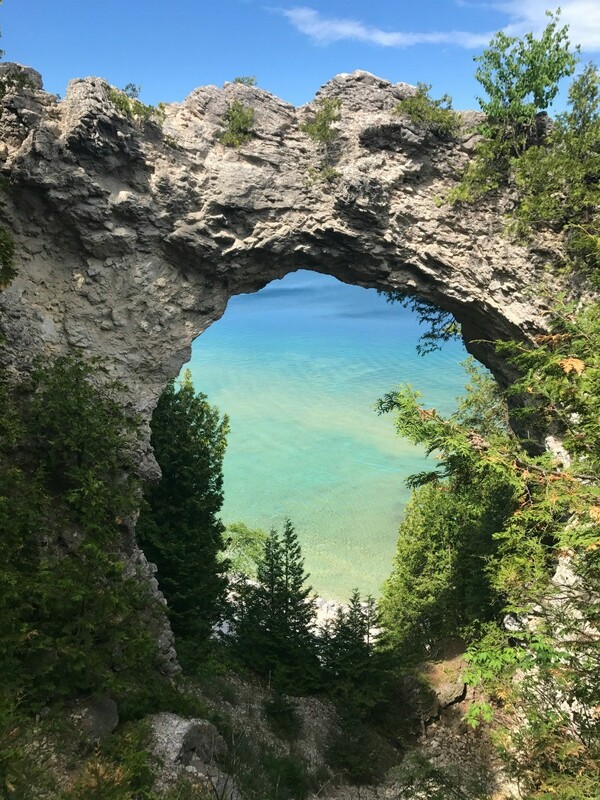 I’ll be back with my Mackinac Island travel guide here soon…leave your suggestions for visiting Sleeping Bear Dunes in the comments below.